Borosilicate Glass Flashlamps | TJS Inc.
Borosilicate glass or hard glass is suited for flash lamps operating under low average operating power. This includes signal beacons, low power stroboscopes and low power photographic applications such as camera flashes. There are four borosilicate glasses characterized by their exceptional resistance to the arc and by optical quality. 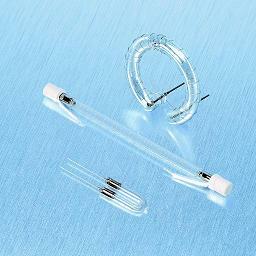 This standard glass is suited for automatic processing ability. We have many tube diameters available. This glass allows up to double the flash energy in photoflash applications compared to B1 with similar automatic processing ability. Hard glass can be coated with a yellow layer that absorbs the excessive blue radiation for photograpic use. The color temperature is reduced by 1000 to 2000 K.
For special applications, flash tubes can be colored with a uniform and crack-free colored layer. Typical colors are red, blue, amber, green and purple.